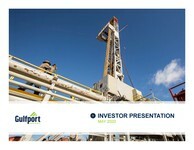 Gulfport is committed to conducting its business not only in accordance with all applicable legal requirements, but also in a manner that respects the health and safety of the personnel working at its locations and the environmental health of the communities in which we operate. Our success is built by achieving our goals of Environmental Health and Safety (EHS) operational excellence paired with positive financial performance. Gulfport diligently works to comply with all applicable laws and regulations in the areas and communities in which we operate. In addition to focusing on applicable laws and regulations, Gulfport implements robust operating protocols and best practices in instances where established rules and regulations are limited. We are committed to applying systems and procedures to ensure compliance with our EHS programs and guiding principles through visible and active leadership. Without exception, safety is a core expectation for all Gulfport employees and contractors supporting our activities. Gulfport conducts routine training of its employees and contractors and expects both groups to take personal responsibility to understand and commit to a safe working environment. It is our pledge to utilize and apply appropriate measures in our effort to achieve and maintain a leading position in safe operations. Gulfport strives to mitigate impacts on the environment and communities in which we operate by making environmental stewardship an integral part of our operations. Gulfport has established measures and engineering practices to help reduce emissions, reuse and repurpose appropriate materials to avoid waste, and design our surface facilities in a manner that reduces risk of environmental impact. For example, Gulfport works towards developing our acreage through the use of multi-well pads to reduce surface disruption. In conjunction with our preventative measures, Gulfport has designed and instituted emergency response and business continuity plans, in order to swiftly and appropriately respond to incidents involving operational disruptions or natural disasters. These measures include prompt notification procedures which allow Gulfport personnel to quickly evaluate and begin necessary mitigation steps, along with notifying appropriate state and federal regulatory bodies, affected landowners, and other potential stakeholders. After evaluation and notification, Gulfport is committed to working with appropriate regulatory bodies and affected parties throughout the remediation process. Gulfport is committed to being a good steward of the environment and preserving the air quality surrounding the areas of our operations. Air emissions are regulated by both federal and state air quality regulations. These regulations establish emissions limits, control requirements, testing, monitoring, recordkeeping and reporting requirements to protect human health and the environment. Our air quality programs are designed to ensure that our operations meet or exceed those federal and state regulations. Gulfport has converted our gas pneumatic controllers to instrument air assisted controllers at all of our pads in the Utica and plan to continue utilizing instrument air assisted controllers at new facilities contemplated in the Utica development plan. We have also replaced our gas driven chemical pumps with electric pumps in our WCBB main facility in Louisiana. We utilize natural gas and low-emission diesel to power well pad operations. We utilize vapor recovery units (VRUs) to recover production gas containing VOC and methane emissions where practical. We use leak detection and repair (LDAR) in our Utica, SCOOP and Louisiana assets. Gulfport will continue to look for innovative ways to minimize the overall environmental impacts of our activities, including the reduction of greenhouse gas (GHG) emissions. Gulfport reports its GHG emissions data annually. Below is an excerpt of the 2017 GHG report filed with the EPA. Gulfport’s total methane emissions from every known source is 114,704 metric tons equivalent (mtons CO2e), which includes everything we operate–our production facilities, our boosting and gathering facilities, our compressors, our water disposal facilities, our completion activities and our recompletion activities (see chart below). To be clear, while we included everything we operate in this calculation, the EPA reporting is limited and does not capture everything. Moreover, the companies that report voluntarily often use different calculation methods, counting or excluding different devices, and often do not disclose what is or is not included in their GHGRP process. The lack of transparency and uniformity makes it difficult to compare the emissions from one company to the next. Finally, there is a cost to the gas we don’t sell. 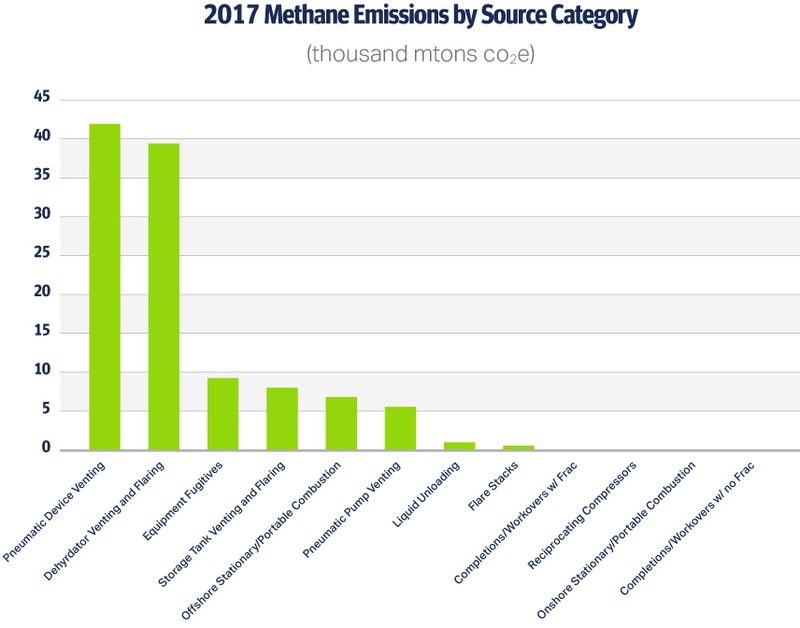 Using 2017 methane emission numbers and the average price we received for natural gas before derivatives in 2017 of $2.42 per Mcf, we estimate the lost value of methane emissions to be $579.1 thousand. In 2017, Gulfport had total revenue of $1.1 billion. $388.9 thousand represents 0.04% of our total revenue. We are working with regulatory agencies and industry peers to address stock tank thief hatches which have historically been one of the industry’s leading sources of methane loss. In addition to re-design, current efforts with thief hatches include limited use through guided wave radar measurement, scheduled maintenance and continued testing of reliable gasket materials. We are working to minimize emissions by deploying centralized full-field compression solutions wherever practical as opposed to the less efficient alternative of individual wellsite compression. We are undertaking a broad effort to ensure we continue to use and research the most efficient devices with all equipment in order to emit the lowest level of methane possible. This includes methods to utilize wind and solar energy to power our wellsite automation systems and facilities optimization plans to ensure the sizing and design of our wellsite facilities are optimized over the life of the well. Gulfport requires its vendors and service providers to (1) have an active ISNetworld account and (2) execute Gulfport's form Master Service Agreement (MSA). Gulfport is contracted with ISNetworld to further evaluate and monitor its vendors with respect to their compliance with industry, state and federal, as well as our EHS requirements. In addition, Gulfport diligently works to screen 100 percent of its new contractors to ensure they understand our expectations, policies and adhere to industry standards. By entering into our Master Service Agreement, contractors agree to provide their services in a safe manner and in compliance with all applicable local, state, regional and federal regulations and laws. If you have questions, please email Gulfport Contractor Management at msa@gulfportenergy.com. To apply to become a vendor, contact your Gulfport Operations Representative and ask for a Vendor Request Form. Forms submitted directly by a contractor will be rejected. ISN can be contacted by calling 214-303-4900 or 1-800-976-1303 (Toll Free), by e-mail at CustomerService@isnetworld.com or visit their website at www.isnetworld.com.